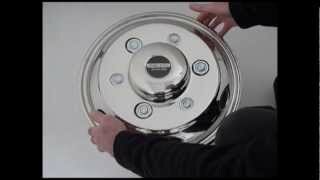 This video explains through 3 simple steps how to install a stainless steel Snap On over the lug wheel simulator. 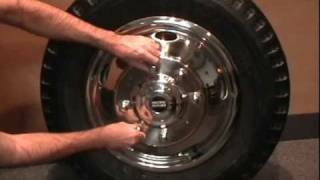 This video explains through 3 simple steps how to install a stainless steel over the lug wheel simulator with lug nuts only. 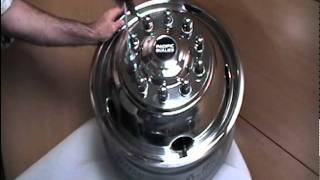 This video explains through 5 simple steps how to install a stainless steel over the lug wheel simulator with stud extenders. 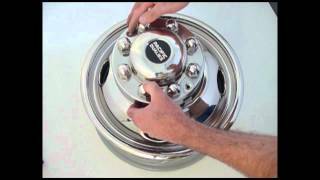 This video explains how to install a Pacific Dualies stainless steel Under the Lug, One Piece Center Cap - 38-1608, With OEM Ring, Chevy Only wheel simulator. 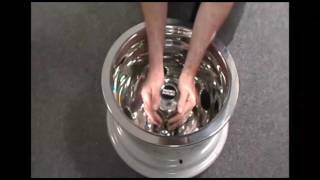 This video explains how to install a Pacific Dualies stainless steel Bolt On w/ Press On Lug Nut Covers - 45-1608 wheel simulator. 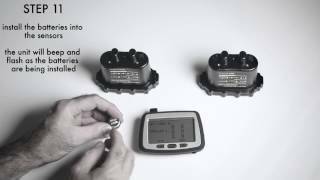 This video provides a tutorial for TPMS Truck and RV setup. How do I protect my Wheel Covers? There are a number of ways to protect your wheel covers from problems including rust and cracking. For this article, well focus on how to protect from crack damage. Low tire pressure: If you run your vehicle with low tire pressure, even intermittently, this can cause the wheel covers to be crushed by the steel wheels, and cause stress cracks to form. Overloading the truck: This can cause the wheel covers to be crushed, and can cause the formation of stress cracks over time. Rust: Rust building up on the actual steel wheel. "Spin Out Rust" can build up over time on the steel wheel, and eventually work its way into the back of the wheel covers. This can begin to weaken the wheel covers and will cause cracks or stress lines at the weakest points. Road Damage: If the wheel covers have suffered curb damage, rocks, or other road hazards, the damaged area (s) may weaken over time, and form stress cracks. You will need to remove the wheel covers and take a look at the actual steel wheel. If you live in a snow state, the salt on the roads can cause some pretty bad rust. Your state may also be using a liquid-like, salt brine solution which is even more corrosive than the salt they spread on the roads in most states. We hope this answers any questions you may have. If you need more information on this, please call Pacific Dualies Customer Service at 800-426-0584. Will Stainless Steel Wheels Rust? If you see rust appearing on your Pacific Dualies Wheel Simulators, don't panic. More than likely, the rust isn't coming from the wheel simulators itself, but caused by "spin out" rust. "Spin out" rust is what happens when rust builds up on the original wheels and begins to spin out from the wheel due to centrifugal force when the vehicle is in motion. To check for "Spin Out" Rust, remove the wheel covers and take a look at the actual steel wheels. Then inspect the steel wheel, hub area, brake drums, lug nuts, etc. for rust and/or corrosion. (Living in a snow state, the salt on the roads can cause some pretty bad rust.) Your state may also be using a liquid-like, salt brine solution which can be even more corrosive than the rock salt that is spread on the roads. If you find spin out rust on the wheel covers, it is fairly easy to remove with any non-abrasive stainless steel cleaner or chrome polish. Then use a cheese cloth or similar soft cloth material to wipe down and buff out the wheel covers. Be careful not to allow the rust to build up for long periods of time, otherwise the rust can "stain" the wheel covers and require more buffing and rubbing to remove. In the photos below is an example of what can happen in a "spin out" rust case with one of our customers. When the customer removed the center cap, he realized the rust was coming from the actual OEM lug nuts, and the OEM wheel. Liquid “Kroil” helps loosen rusted parts. Rust proofing paint called “PRO 15”. We hope this answers any questions you may have regarding rust. If you need more information on this, please call Pacific Dualies, Inc. at 800-426-0584, and ask for customer service. We are located in Los Angeles, CA. For what vehicles do you manufacture wheel simulators? Pacific Dualies manufactures wheel simulators for Chevy, Ford, Dodge, Isuzu and also various International dually trucks and vehicles. Our applications covers a wide range of vehicle years dating from 1970 through the most current vehicles on the market today. For details and to check availability for your specific vehicle please browse through our products here. How do wheel simulators attach to my truck and wheels? Mounting style designed to bolt onto the wheel by using the original equipment (OEM) lug nuts. Removal of the (OEM) lug nuts from the wheel is REQUIRED in order to properly mount these simulators. Mounting style designed with steel gripping teeth reinforced by springs that grasp firmly on the wheel holding the simulator securely in place. Mounting style designed with built-in jam nuts that screw over the original equipment studs on the wheel. Removal of the original equipment (OEM) lug nuts are NOT REQUIRED. Mounting style designed with every other lug nut removal per wheel. This kit uses press on style lug nut covers. Can I purchase component parts? If you've lost and/or damaged any one piece of your wheel simulator set (lug nuts, center cap, wheel liner cover etc. ), you can purchase any individual piece just by itself. Browse through our products here to find the individual component part that you are missing and contact us toll free at: (800) 426-0584 to find the nearest distributor, jobber or retailer. There is no need to purchase an entire set if you loose or damage just one part of your product. Please read more about our warranty here. Do you offer specials or discounts for your wheel simulators? Please read more about our special offers here. What key differences set Pacific Dualies Wheel Simulators apart? When buying wheel simulators price and quality are always opposing forces. Depending on individual driving habits, product care, weather patterns, road conditions and other related variables, different types of wheel simulator quality standards from various wheel simulator manufacturers will have variating results when it comes to the longevity of the product. From our experience, spending a little more money on the right set of Wheel Simulators is the best choice over choosing price and having to go through the hassle of replacing them frequently (in some cases in the end, buying the high quality simulators). When it comes down to making a decision, customers must debate what is right for their situation: focus on price now and pay/spend more time later, or pay it forward and have peace of mind in your investment. Who, what and where is Pacific Dualies? Pacific Dualies, Inc. manufactures and distributes high quality and polished wheel simulators for Chevy, Ford, Dodge, Isuzu and various International dually vehicles. We have been doing this for over 20 years and depending on who you talk to we were the pioneers in the industry and have since then opened up markets for many other players now in the market. Pacific Dualies focuses heavily on using the highest quality materials and manufacturing processes to provide customers with a strong stainless steel wheel simulator with highest level of shine. Furthermore we pride ourselves on providing the best customer support and service possible. All Pacific Dualies wheel simulators are backed by our lifetime warranty; we put our money where are mouth is. With over 25 years of wheel simulator experience, Pacific Dualies continues to be a leader in the industry. Shop Now!